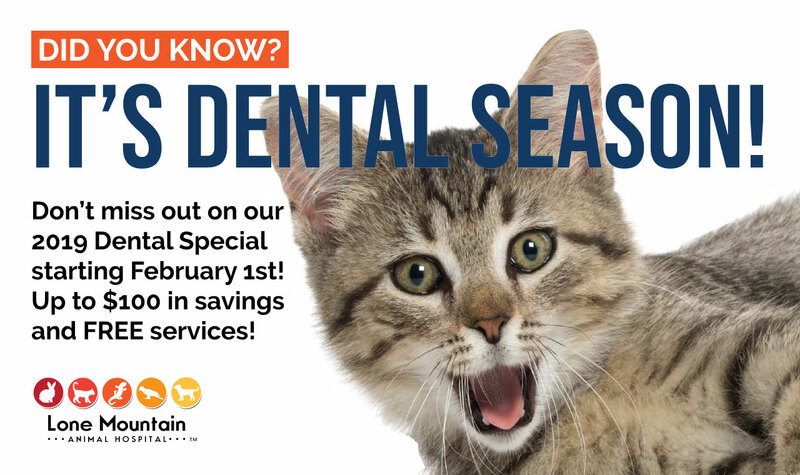 Don’t miss out on our 2019 Dental Special starting February 1st, 2019! *Up to $100 in savings and additional free services! Dental health is a very important part of your pets’ overall health. Dental problems can cause, or be caused by, other health problems. Your pet’s teeth and gums should be checked at least once a year to check for early signs of a problem. Watch our video for more information. Dental cleaning prices exclude, blood work, x-rays, extractions, and other services. A full estimate will be given at time of dental exam or check-in. Click above to schedule your next visit! Copyright 2018 Lone Mountain Animal Hospital, All Rights Reserved. Lone Mountain Animal Hospital | Powered by Mantra & WordPress.